If you’re a fan of healthcare improvement, or of the e-patient movement, or social movements in general, and if you know anything about tweetchats in general or the #HCLDR tweetchat in specific, mark your calendar for next Tuesday night, 8:30-9:30 ET. I’ll be that week’s guest, and it’s going to be wild and wooly and intentionally mind-bending. In short, ten years ago the e-patient movement was getting born – well, it already existed, but it was beginning to get noticed, and with social movements getting noticed makes all the difference. Emergence is a scientific principle that I’ll say more about over the weekend. 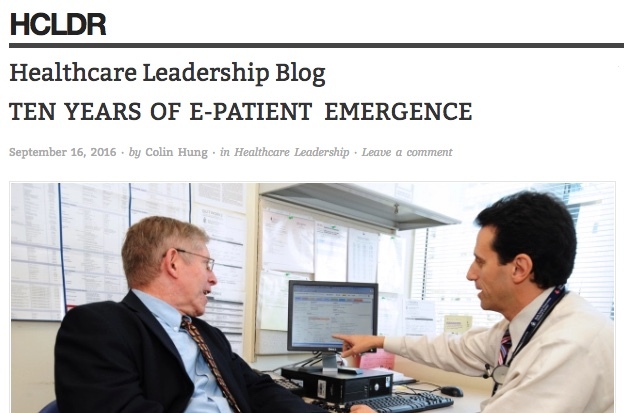 Click the photo above to go to the HCLDR blog post to learn more about it in this context. In short, ten years ago the e-patient movement was like individual birds, and emergence is when new behaviors emerge in flocks of something. Things are changing. Please click and learn. We’ll have more to say afterward. Awesome, can’t wait to join! !